Meet the leaders using their transformational acumen to help shape the future of technologies and trends. 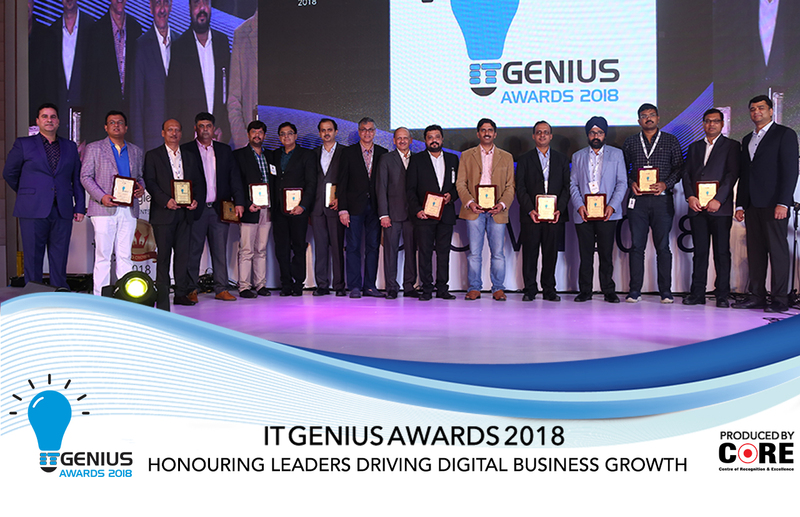 Now in its 2nd year, the IT Genius Awards by CORE Media seek to recognise and honour ICT leaders whose innovations, digital transformation ideas and IT initiatives have had an impact on the business landscape. This year 13 CIOs were recognised on August 25, 2018, as part of CIO Crown 2018, for their contributions to the tech world, for challenging competition and delivering ROI to the enterprise. An independent jury using a lens of five key criteria scrutinised each nomination. The criteria were type of project, the innovation used, process of implementation, the project’s impact, and scalability. The winners were selected in five categories— Analytics and Data Discovery, Artificial Intelligence, Data Centre Excellence, Digital Transformation, and Fintech Innovation. This year’s illustrious jury comprised Anil Nadkarni, Director, NKGSB Bank, Vikas Gadre, Chairperson and Senior Adjunct Faculty for IS area, NMIMS, Sandeep Phanasgaonkar, business strategy consultant and former CIO for large conglomerates, and, Pratap Gharge, former Executive President and CIO, Bajaj Electricals. Achal Kataria, VP & Global Head of Technology, EXL Service, receives the IT Genius Award 2018 for Analytics & Data Discovery from jury members Anil Nadkarni, Director, NKGSB Bank, & Vikas Gadre, Chairperson & Senior Adjunct Faculty for IS area, NMIMS, & Sudhir Kamath, Country Director, CORE Media. Dhananjay Rokde, Head IT, D’Decor Home Fabrics, receives the IT Genius Award 2018 for Analytics & Data Discovery from jury members Vikas Gadre & Anil Nadkarni, & Sudhir Kamath. Rajeev Mittal, CIO, Endurance Technologies Ltd, receives the IT Genius Award 2018 for Analytics & Data Discovery from jury members Vikas Gadre & Anil Nadkarni, & Sudhir Kamath. Santosh Singh, VP IT, Dharampal Satyapal Ltd, receives the IT Genius Award 2018 for Analytics & Data Discovery from jury members Anil Nadkarni & Vikas Gadre, & Sudhir Kamath. Kiran Komatla, VP IT, Burger King India Pvt Ltd, receives the IT Genius Award 2018 for Artificial Intelligence from jury members Anil Nadkarni & Vikas Gadre, & Sudhir Kamath. Pravin Savant, Group CTO, MullenLowe Lintas Group, receives the IT Genius Award 2018 for Artificial Intelligence from jury members Anil Nadkarni & Vikas Gadre, & Sudhir Kamath. Kiran Belsekar, Senior VP & Head IT, ENAM AMC, receives the IT Genius Award 2018 for Data Centre Excellence from jury members Vikas Gadre & Anil Nadkarni, & Sudhir Kamath. Dipesh Thakar, Head Information Security & Digital Transformation, Waaree Energies Ltd, receives the IT Genius Award 2018 for Digital Transformation from jury members Vikas Gadre, & Anil Nadkarni & Sudhir Kamath. Rajesh Garg, CIO & VP - Digital Transformation Solutions Delivery, Rolta India Ltd, receives the IT Genius Award 2018 for Digital Transformation from jury members Anil Nadkarni & Vikas Gadre, & Sudhir Kamath. Balvinder Banga, CIO, Sonata Finance Pvt Ltd, receives the IT Genius Award 2018 for Fintech Innovation from jury members Anil Nadkarni & Vikas Gadre, & Sudhir Kamath. Sachin Lokhande, CIO, Pay Point India Network Ltd, receives the IT Genius Award 2018 for Fintech Innovation from jury members Anil Nadkarni & Vikas Gadre, & Sudhir Kamath. Subhamoy Chakraborti, Chief Digital Officer, Magma Fincorp Ltd, receives the IT Genius Award 2018 for Fintech Innovation from jury members Vikas Gadre & Anil Nadkarni, & Sudhir Kamath. Umesh Mittal, Group Head-IT, Alchemy Capital Management Pvt Ltd, receives the IT Genius Award 2018 for Fintech Innovation from jury members Vikas Gadre & Anil Nadkarni, & Sudhir Kamath. All the IT Genius Award 2018 winners pose with jury members.